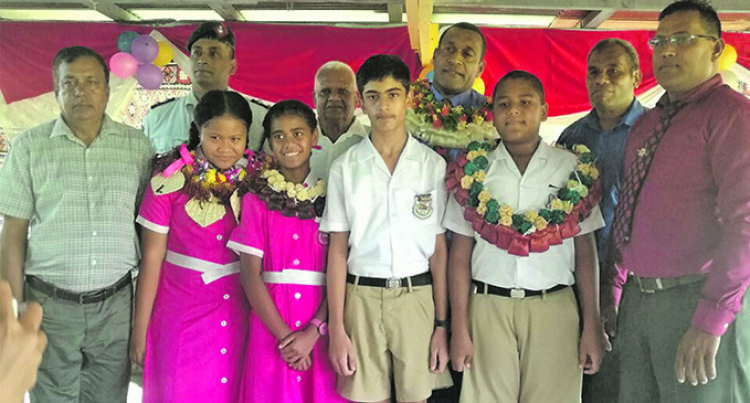 "After being inducted as head prefects, the new student leaders of Vashist Muni Primary School were urged to be­come true role models." Ministry of Education principal officer Marika Baleca with Vashist Muni Primary School head prefects and school staff members. After being inducted as head prefects, the new student leaders of Vashist Muni Primary School were urged to be­come true role models. The call was made by the Minis­try of Education principal officer Marika Baleca during the induc­tion ceremony at the Vashist Muni Institute Hall in Navua recently. As chief guest, Mr Baleca induct­ed 97 prefects into their new lead­ership roles. He told prefects that as leaders, they needed be role models by ac­tually doing the work to influence all who followed them. There are 1200 students under the care of the school’s 40-member staff members. Head boy Aryan Ayush Deo was excited while head girl Alefina Lee said their new roles would be a challenge. Remesio Waqaliva and Luci Danford of Year Seven were appointed as deputy prefects. Head teacher Divendra Bijay told the student council that there would be workshops for the pre­fects.